On return from an enjoyable couple of weeks break, the first job is to finish the Poster I started for various forth coming PC3 events. 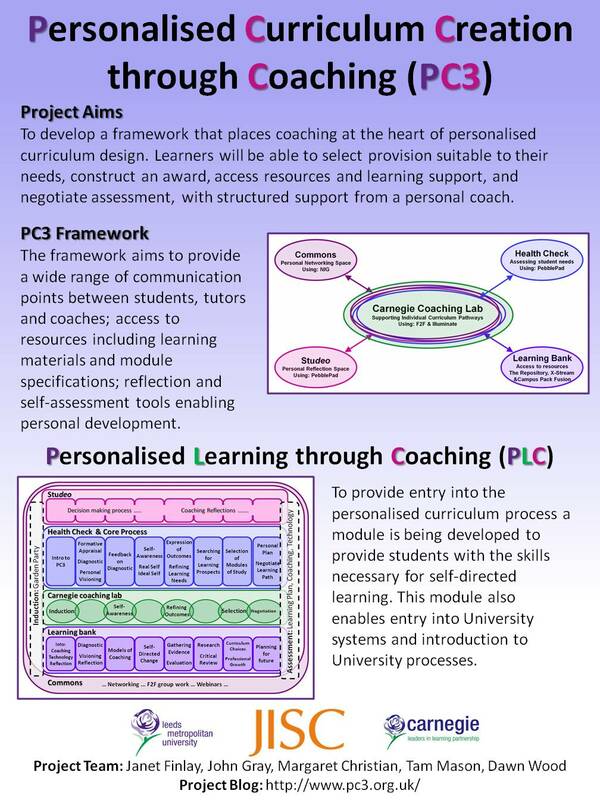 The aim is to capture the developments we have made since the our initial conception of the PC3 framework. One the primary moves forward has been in investigating and choosing the technology to underpin the process. These are reflected in the changes to the over view framework (diagram at the top of poster). The next step in this process is work out the best way to integrate or present all this individual systems to students as a coherent set o tools. At the moment XStream looks to be the main entry point. I have a workshop next week on Campus Pack Fusion so hopeful should be able to start that development soon. The second main development has been the creation of the *PLC module* discussed earlier. I’ve tried to capture the main elements of the module and show clear links between the process and the technology framework. There is a lot to cover over the next few months, including gathering as many LOs in the topic areas, improving access to course specifications and creating the competency maps within PebblePad.